Anyway, as much as we love Pete, we think it’s important to bring attention to his partner, the lovely, talented and dog-loving Rachel Fuller. Ms. Fuller–a British musician–is an exceptional songwriter, famous for her impeccable vocals, her witty lyrics and her ambitious musical projects. She has a rich biography–too colorful, varied and kooky to describe here–but in brief: Fuller has released quite a few albums, including the critically-acclaimed Cigarettes and Housework (2004), Week in Kew (2008), Shine, and a compilation of songs based on the films of Pedro Amaldovar (2010). Her song ‘Wonderland’ appeared on the soundtrack of the American movie “Shall We Dance?” in 2004, and this song broadened her audience significantly here in the US. Fuller also writes musicals: her show “Ash” debuted in the UK in 2008). She was the host of the popular online musical series “In the Attic,” and has collaborated on several projects with that rock-star partner of hers. Currently Rachel is working on an orchestration of the Who’s masterpiece Quadrophenia. And if that weren’t enough to keep a woman busy, Rachel Fuller is also the headmistress of seven dogs, ranging in weight from twelve to one-hundred and twenty pounds. That’s a lot of dog. Most of these happy canines reside at Rachel and Pete’s main residence in Richmond, while others are lucky enough to get to travel with Rachel to her house in Southern France. I spoke with Rachel back in 2009 when she had “only” six dogs. We had a lovely chat about life with dogs. LH: How did you come to have so many dogs? RF: When I was twenty-six, I lost my mother very suddenly, and decided it was time for me to care for and have the love of a dog! I was in a relationship with my beloved (Pete) but I was living alone (in London), and I guess I was grieving, and although I had never owned a dog, I understood from friends that they were great companions! So maybe I just wanted some company? Along came Spud, my first golden retriever. Spud helped me through my grief, he is a very kind dog, gentle and sweet. LH: Did Spud help you through your grief in a way that the humans in your life could not? 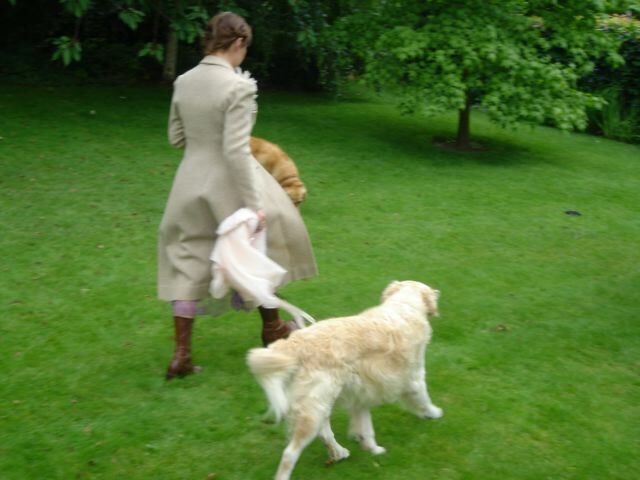 RF: I think we grieve differently when we are alone, and the unconditional love and understanding of a dog is perfect I think.] 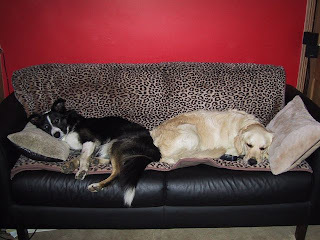 Around the same time, Pete rescued a Border Collie—Flash—and he and Spud became great friends. Flash was rescued at about five months of age. He had been mistreated by a male, and is still very wary of strange men at first, but once he knows they are no threat, is fine. He was on “death row” at a dog rescue. LH: Was Pete a Border Collie fanatic before getting Flash? 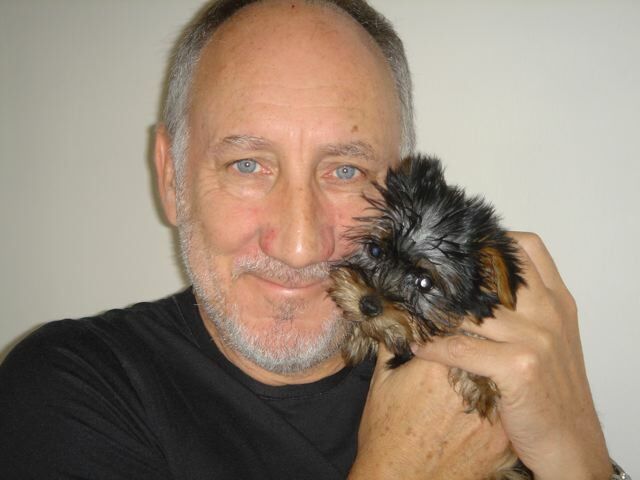 Did Pete know what he was getting into, in other words, with such an active and intelligent breed? 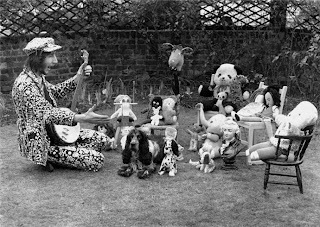 RF: Ha-ha, no, Pete had always had dogs, even as a child, but they were all spaniels. He had no idea what he was getting into, but Flash fits in very well. We live near a park and he gets lots of exercise. Flash has always been a typical Border Collie – ready to herd sheep twenty-four hours a day. He is indefatigable. As I said, Flash and Spud became great friends. 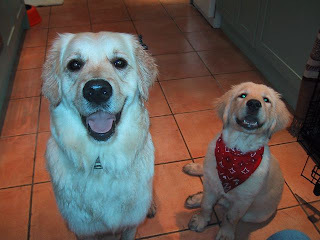 Pete and I were still not living together at that point, so two years later I decided Spud should have a canine buddy. Plus I have a bottomless ocean of love to give. Thus, I got Harry–a terrier. Harry is a scream. Very feisty and fun. He has always smiled for a camera (I kid you not, see photos). 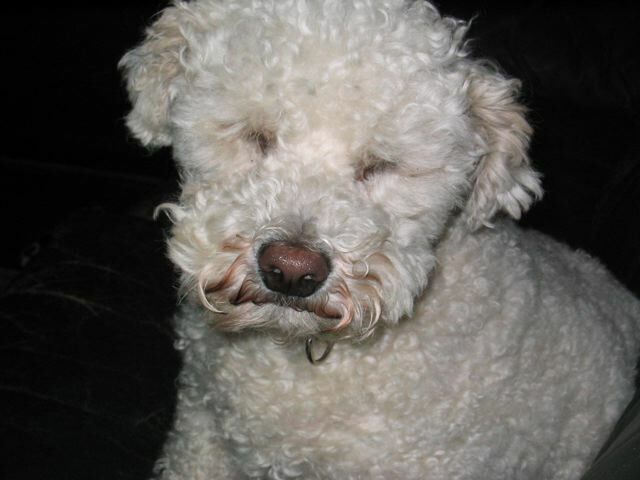 Two years later, along came Barney the Bichon. He came with a circus trick, standing on his back legs and waving his front paws in the air in a rhythmic circular motion. He seems to do this whenever he feels any kind of powerful emotion. Joy, hunger, love, need. We adore him. Barney is absolutely devoted to Harry. We call him Harry’s Lieutenant – Barns Minor. So when Pete and I finally moved in together, I had my three dogs—Spud, Harry and Barney—and he had Flash. LH: So that’s four. Never too much of a good thing. LH: I understand that Pete has an at-home recording studio, and that you like to compose at home as well. How does that work—two musicians and six exuberant barking dogs? RF: When it was just Spud and I, he was always happiest asleep under my grand piano, whether I was playing or composing. Now, I either write alone, or Spud and Wistle sleep whilst I write at my piano. I’m happy to have all of them around me when I am working on lyrics. When I compose at my studio in Kew village, I often take Wistle. LH: In fact, legend has it that when you were writing and recording your record “Week in Kew,” you sequestered yourself in your studio for a full week and wrote one song per day, writing song lyrics on the walls. You limited all human contact, but you brought Wistle. He must be very quiet? RF: When Pete and I record at home we have to put [the dogs] in their room as any noise they make ends up on the track. I have a few masters with a faint bark on them though. LH: As a classically-trained pianist, you have a good ear. Are there certain sounds your dogs respond to? LH: As a musician, and as a part-time resident of France, you must travel a lot. You have also toured with The Who and hosted a popular and innovative webcast series called “In The Attic” which also involved lots of travel. Do any of the dogs travel with you? RF: The three littles all have dog passports. I think it would be too hot in the South of France for the big guys. We have a fabulous guy called Perry who works for us as a dog walker and caretaker. We live by the river and practically adjacent to Richmond Park, so twice a day, they go for a good 90 minute walk. If we go on tour, Perry moves into our house and lives with the dogs – so their routine and environment stays the same. Pete walks the pack often on a Sunday – which he absolutely loves to do. I often will pick one or two, and Wistle comes everywhere. 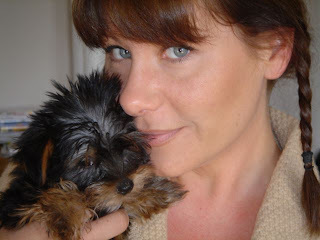 Editor’s note: Rachel now has a seventh dog, another Yorkie named Skrapovsky. Skrappy has been residing in splendor in Southern France since 2011. LH: You are a famous for being a great beauty and a very sharp and stylish dresser. How do you manage this amongst the drool and dog-hair? RF: I’m pretty much always covered in dog hair. The littles don’t shed, but Flash, Spud and Harry are terrible! I don’t even notice it anymore. If I’m going somewhere special, I put my outfit on at the last minute before we leave and check for hair. Someone should invent a dog Hoover. Hoover the dogs every morning instead of the house? My friend Lucie and I like to work out what kind of outfits the dogs would wear. We think this. Cracker – like a teen skateboarder with low rise baggy jeans. LH: Do you have a particularly dog-friendly decor in your houses? RF: The dogs have their very own room. It has beds, heating and air-conditioning. The room we spend most time in together has a stone slab floor and leather sofas, which is about as dog friendly as you can get. Sometimes we think we should just put straw on the floor. It gets dirty, especially in the winter. You can’t be precious about décor with so many dogs. There are some rooms in the house that the dogs don’t go into, but the room we all share is super dog friendly. LH: You are also famous for being a committed supporter for animal charities. RF: Our main support is for a small independent Border Collie rescue centre here in the UK called Wiccaweys. The couple who run it, Sarah and Paul, are utterly dedicated to rescuing the worst cases and work very hard at re-homing them. They are amazing – and the volunteers are also inspiring. I fund-raise as much as I can [including a well-publicized auction of an impressive collection of Pete’s guitars and personal items] and have had the pleasure of judging collie shows. I want to help the dogs. I’m so appalled by animal cruelty. I didn’t want to bury my head in the sand and just throw some money at a big charity. I want to be involved in the reality. Sarah and Paul really keep me up to date with all the new arrivals, and re-homings. They also have an amazing web-site www.wiccaweys.com. LH: I checked out their website after you recommended them. Wiccawey’s adoption guidelines are superb—those guidelines could serve as a model guideline for any rescue group specializing in Border Collies and working sheepdogs. RF: They deserve all the praise they can get. Chloe Chronicles Part VI from Bark Magazine--Enjoy! Those of us with exuberant dogs (herding dogs, hunting dogs, tracking dogs … well, just about any dog, really) truly appreciate their exuberance. We even appreciate their excessive need for entertainment and exercise; it helps get us up and moving, after all. But admit it, my fellow exuberant-dog caretakers: don’t you sometimes just want to sit down and relax? Especially during the lazy days of summer? 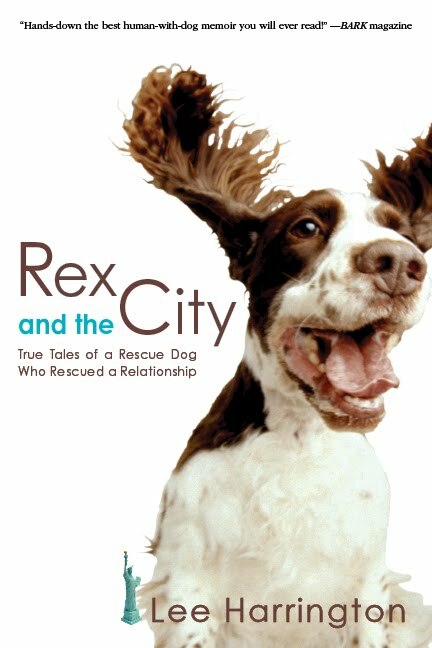 Before we get to the answer, I must preface this with a description of life with my first dog, Wallace (the subject of Bark’s “Rex and the City” columns). He was a Spaniel/ Setter mix, as hyper as they come, so I never got to sit down and relax in any season. To get him even remotely tired, he needed to be taken outside — where he could gallop, chase squirrels, swim after ducks, leap fences — for at least four hours a day (12 was even better). Accomplishing this was quite a challenge, given that my then-husband, Ed, and I lived in a 300-square-foot apartment New York City. But, because our lives revolved around our beloved dog’s needs, we took Wallace hiking as often as we could. I am grateful for this. Wallace’s exuberance led us to discover some truly amazing parks, hiking trails and beaches within driving distance of NYC. There was the beach at Jacob Riis Park in Rockaway, Palisades Park in New Jersey, and the “remote” Fort Tryon Park at the tip of Manhattan (90 blocks is “remote” to a New Yorker). My favorite hiking trail became Breakneck Ridge in Cold Spring: an easy and scenic onehour drive up the eastern side of the Hudson River. It’s not an easy trail, and some of the climbs to the ridge are rocky and — to me — a bit treacherous, but the views made it so worth the effort. You could see for miles: the Catskill Mountains … the bluffs at Bear Ridge … and the great and majestic Hudson River, which threaded its way mightily all the way down to New York City. The water, from our vantage point, looked pure and silver. I loved to watch sunlight dance across the river’s surface, as if in celebration. From the ridge, the world seemed beautiful and vibrant and manageable. We would hike down feeling renewed and ready to take on life in the city again (which could be challenging, to say the least). After our hike, Wallace, dear Wallace, would be tired, so tired that he could barely keep his eyes open as he sat upright in the back seat of the car, resting his head against the window trying to take in the last bit of scenery as we drove south. A tired dog is a wonderful sight. It was also wonderful to see him run for three hours straight on those trails. As soon as we unhooked his leash, he would gallop off, chasing squirrels, following scent trails and basically just seizing the day. We could hear him barking wildly in the distance — a bray of chase and joy — and when he returned, panting, he’d be covered in burrs and leaves, his eyes so bright we thought he had had a glimpse of the Great Beyond. Yes, I will always be grateful for my exuberant dog. He brought us nature and hiking and Breakneck Ridge. In the non-hiking hours, however, I must admit that he could be rather a pest. Whenever I sat down to write, he would nudge me and poke me with his snout, running back and forth from my desk to the apartment door. Whenever Ed was stretched out on the sofa watching TV, Wallace would nudge him, too, wedging his head underneath Ed’s hand — the hand that held the remote. If I tried to meditate, he’d crawl on my lap and splay out for a belly scratch. If I tried to do yoga on the living room floor, he’d come and lick my face and then lie underneath me on the mat as I moved into downward-facing dog. After Wallace died, I adopted another Spaniel mix, Chloe. I was divorced by then, and some of my friends and family questioned my decision to adopt yet another exuberant hunting dog. Especially given that I was living alone in New York City. But we often fall in love with certain breed types, and even certain mixes. Those of you who are familiar with this column know I adopted Chloe sight unseen, and that I adopted her because I fell in love with her picture on Petfinder.com, and because she was listed as a Spaniel/Setter mix, just like Wallace. I was prepared for a dog who would want and need to gallop four hours a day. When I met Chloe, I began to suspect that she was also part Border Collie and/or part Lab as well. Did this mean she would need 12 hours per day — four for each breed characteristic? For a few weeks, I was a bit terrified: a Border Collie in New York City? I kind of prayed that she was mostly Spaniel. Her markings (white with patches of brown) could be either Border Collie or Spaniel. She has those intense Border Collie eyes, however — those “I will stare at you until you do what I say” eyes. Would I ever be able to sit down and relax again? I also have to admit that, by the time I adopted Chloe, I had become lazier about exercise in general and hiking in particular. Truth be told, it was my former husband who was the hard-core outdoorsman. Once we split, there were no more arduous six-hour treks up steep, rocky ridges for me. But I was willing to resume that old habit to keep my new dog and myself in tip-top shape. Fortunately, by then, I also lived part-time in Woodstock, which is situated just at the edge of the Catskill Mountains. There are plenty of parks and trails through which an exuberant dog can gallop and play. My favorite trail is right in the heart of the village. I like it because it is easy and flat and relatively short — it takes about 45 minutes to walk the loop. I especially like it because of its simple beauty: the trail threads through meadows and forests and then meanders along the banks of a robust stream — one that, in spring and summer, teems with waterfowl and frogs and fish. Wallace would have gone into a birddog frenzy at the sight of the fowl, and I figured Chloe’s Inner Spaniel would be activated as well. But the first time we hiked that trail, Chloe ran straight past the waterfowl and plunged into the water. It turns out my bird dog is a water dog, more interested in what lies beneath the water than what paddles along on its surface. I’d never seen anything like it. She ran into the water, tail held high, and immediately began trolling for fish. She gazed intently in the shallows (with those Border Collie eyes) until she detected even the slightest movement beneath the water. Once she spotted one of those tiny minnows, she pounced. I stood and watched her race up and down the shore for a few minutes, splashing happily through the shallows. Part of me was eager to keep walking, to maintain our fat-burning, aerobic pace. I figured Chloe would tire of fish-trolling once she figured out that fish were not easily caught. But I quickly realized that the fun, for her, was in the pursuit. She continued to track, flush and chase these fleeting creatures for the next hour. Sometimes she swam into deeper water to flush out trout; other times, she stuck her snout into the water to try to catch one with her teeth. Her tail wagged non-stop the entire time. After a while, I sat on a large, flat rock and watched, enjoying her enjoyment. I personally did not get much exercise that day, but Chloe did. And once we dog lovers discover something our dogs love, we tend to go out of our way to provide more of it for them. Thus it was that I discovered that the Catskills have all sorts of hidden streams, creeks, ponds and swimming holes. Chloe loved every one of them, for each contained different types of fish, which swam at different speeds. She quickly developed new skills to adjust to each variety. Since my divorce, I had become pretty serious about my spiritual practice, sometimes doing up to four hours a day of yoga, mediation, chanting, chi gung and so forth. Though this can be time-consuming, I find that doing these practices ends up creating more time — quality time — and I can get more done in the day. But still, I am human, and we humans do love to multitask. New Yorkers seem particularly creative with their multitasking, especially when it comes to their dogs, so you’ll often see city dogs “doing errands” with their guardians: walking four blocks to the dry cleaners, helping to carry home groceries with their little doggie backpacks, scoring cubes of cheese at the Friday-night wine tastings, among other things (in NYC, wine tasting at the local wine shop is an “errand”). I quickly realized that having a water dog was perfect for my new lifestyle. Each day, we drive to our favorite park and walk 20 minutes along a forest trail until we reach our favorite stream. There, Chloe trolls for fish while I do, first, my standing practice (chi gung, yoga) and then my sitting practices (meditation, mantra). I love these mornings especially in summer. I love the bubbly sound of the water (the stream always seems to be singing). I love the sound of Chloe splashing; the sight of the sunlight dappling through the trees; and the smell of so many elements: water and wood and stone and air. At that stream, it smells like Mother Earth herself. It smells like home. Sometimes I find myself missing those hard-core hikes at Breakneck Ridge, and seeing those grand vistas with all their promises of greatness and grandeur. Sometimes I miss standing atop a mountain, above the teeming masses, so close to the sky and clouds. But at this stage in my life, I really value the stillness of sitting quietly by a stream. I am grateful for the opportunity to touch the earth, and rest, and go within. Yes, we get the dog we need. When I was married, we needed a dog who would get us out of the cramped apartment and into nature — my husband and I would have killed each other otherwise. When I got divorced, I needed to slow down, look inside and center myself again. And how cool is it that I get to do this and tire out an exuberant hunting/herding/fishing dog at the same time? It’s a perfect arrangement. We are both refreshed and content. Each day, Chloe has an opportunity to cultivate her Inner Water Dog and I get to cultivate my inner self. After 90 minutes or so, it is time for us to go home. Chloe is often reluctant to get out of the water — she’ll look at me with a confused, almost betrayed, expression. But eventually, she’ll conclude that I am indeed serious about leaving the park, especially when I turn and walk away. Then she’ll bound out of the water happily — on to the next great adventure: sleep. Please note that this blog has been,and shall continue to remain, horribly neglected until I can either find an assistant or clone myself. But I think the assistant would do a better job! In the meantime, please visit my facebook pages for the latest updates regarding books, music, writing, and dogs. Thanks you for your kind patience. More from the Chloe Chronicles: "Springer Has Sprung"
Like many people with rescued dogs, I do not know the exact age or birth date of my French Spaniel mix, Chloe. When I adopted her in the fall of 2004, I was told she was between six months and one year old—which is a wide margin, considering how much a dog grows in that first year. And while part of me wanted to believe she was at least a year old (because she weighed 55 pounds at the time and I doubted that I could physically handle anything beyond that), I decided to give Chloe a March birthday. Why was this important? Because I wanted to throw Chloe a birthday party, of course. We always welcome a reason to celebrate our new shelter dogs, and what better day to celebrate than March 20—the first day of spring. Anyway, winter is behind us now, and signs of spring in New York City are everywhere. On the sidewalks, you’ll pass dozens of mini-gardens planted in the city’s tree beds and protected by low iron fences. Because volunteers or townhouse owners or neighborhood associations take charge of these mini-gardens, each one is different and beautiful in its own unique way. Beneath one tree you might see clusters of purple hyacinth mixed with white dwarf daffodils; the next flower bed will contain clusters of colorful primroses arranged within tight tangles of ivy; next: a riot of eye-popping tulips in pink, orange and red. It’s wonderful to see so much color after so many months of gray. We start walking our dogs almost 10 times a day because we just want to be outside, soaking up all that beauty. Often you’ll see little signs posted at the base of these tree beds, with the message: Please do not let your dog urinate on the flowers, and we dog people always respect that request, because spring in New York City is a time of happiness and renewed hope. Every New Yorker is in love with the world in spring, so we are kinder to one another, and more considerate. We smile and make eye contact. We take time along the way to smell the flowers, as they say. Thus, no one messes with the flowers. Plus, as I always tell the dog, there are plenty of other places to pee in New York. But getting back to Chloe’s birthday. 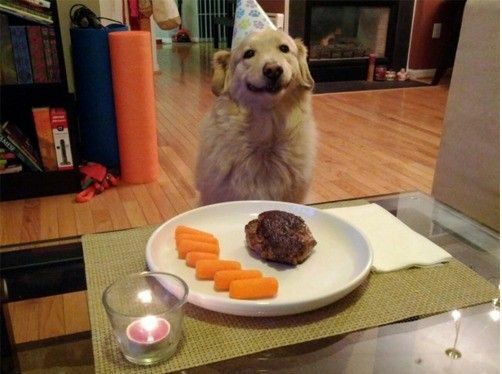 Many people scoff at the idea of throwing a dog a birthday party, but those people are usually not dog people. They might not understand our belief that each of our dogs deserves his or her own “special day” just as we all deserve one. Or two or three or three hundred and sixty-five. One could argue that with shelter dogs, the desire to create a special day is even stronger, because these dogs may have suffered cruelty or neglect. These dogs may have spent months in cages, without being treated as “special” at all. So bring on the marching band because we’re having a party. Now, New Yorkers are known for going over the top when it comes to parties. I know people who have spent hundreds, if not thousands, of dollars for doggie birthday parties and doggie weddings. There are bakeries that make chicken-andoatmeal birthday cakes frosted with liver pâté. There are doggie daycare centers that rent out party rooms for more money than you’d pay for your own wedding reception. There’s even a boutique that sells tiny rhinestone “Happy Birthday” tiaras for lap dogs to wear to parties on the Upper East Side. I am not judging any of this. I celebrate any occasion at which a bunch of dogs get to play and have fun. But, being a writer, I was on a limited budget; therefore, Chloe was not going to have artisanal foie gras “pupcakes” at her party; nor was I going to rent a 3,000-square-foot space and hire an agility instructor to teach all the dog guests to leap over hurdles and shimmy through plastic tunnels and hoops (bummer). Also, I don’t cook, which meant there wasn’t anyone in my household who was going to spend four days constructing shepherd’s pie cupcakes from organic buffalo meat, vegetable terrine and mashed fingerling potatoes. No, I was going to keep this party simple. Plus, I reasoned, dog people—when you get down to it—are easy to please. Know what I mean? We’re more down to earth, in a way, because our dogs constantly ground us and teach us to focus on the simple pleasures of life: nature, exercise, food, play, sleep. So who needs fripperies when the guest of honor is perfectly content with a dirty old tug-arope, a couple of dog pals to steal it from, a gingersnap and some praise? I decided to hold the party at our local dog run, which happened to be one of Chloe’s favorite places in the world. The invitations consisted of a handwritten notice posted on the community board inside the run and a quick announcement on NYCDog’s Manhattan Dog Chat site. I requested “No presents, please” and encouraged well-wishers to make a small donation to Animal Haven instead. On the morning of Chloe’s assigned “birthday,” I fed her a special breakfast of lamb chunks (which she loved) and presented her with a pretty new collar. This collar was quite chintzy—a pink faux-velour band with fake pink crystals and rhinestones and embroidered flowers. But that is why I liked it. It looked like spring—something a six-year-old girl would wear as a belt to an Easter parade. And no, I did not spend hundreds of dollars on this collar: it came from Target and cost 12 bucks. Chloe looked very pretty with her new collar, and I also had her groomed for the occasion, so her white-and-brown coat was sparkly and fluffy. At the party that evening, friends noticed the coat and new collar, and everyone went out of their way to praise Chloe and scratch her belly and tell her happy birthday. Chloe seemed to enjoy all the extra attention she was getting. It’s always nice to be told one is pretty. It’s always nice to be told one is a “good dog” and a “special girl.” Her tail wagged nonstop for hours. People brought the usual assortment of sour, bitter and pickled foods to the party, plus a few bottles of wine—all of them from dog-themed wineries such as Mutt Lynch and Faithful Hound. Many of my dog-run friends cheated on the no-presents rule and brought presents for Chloe—toys and small packages of treats—and one friend actually made a little birthday cake (peanut-butter-flavored, with yogurt icing). I asked this dear woman to hide the cake until the party was over. Chloe, it must be said, had been the instigator of many a food fight, and I just didn’t trust her anymore. Not even on her own special day. 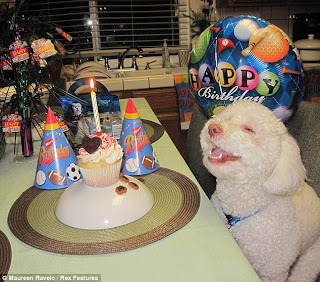 There is a famous line from the movie Casablanca, in which one of the male characters is described as “like any other man, only more so.” I guess we could say that, to a dog, a birthday is “like any other day, only more so” as well. At her party, Chloe played with her usual pack of friends: Greyhound mixes and Jack Russells and Lab mixes and Pit Bulls. They chased one another around the perimeter of the one-acre run, rolled in the dirt (or rather, mud, given that this was spring) and played tug-of-war and keep away. 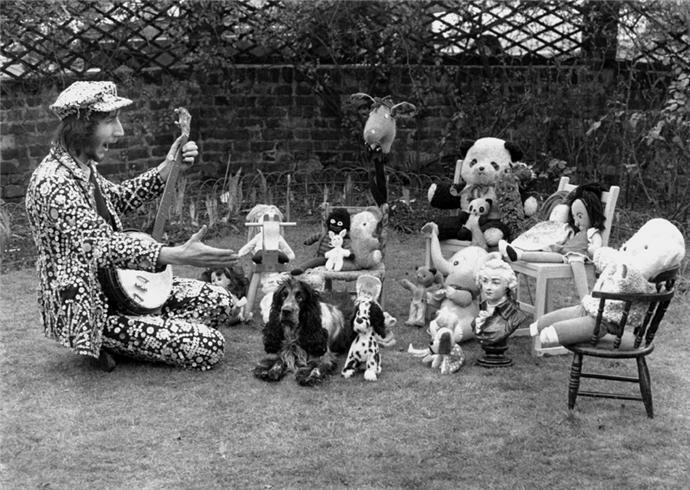 Their joy was a celebration of play itself. After a few bottles of wine, we humans sang a rousing and slightly off-key rendition of “Happy Birthday” to Chloe, trying to coax some of the hounds to join in. Barley the Bassett obliged, adding a singular high note to the finale. Then we brought out birthday hats—those little cone hats with those elastic strings that wraps under the chin. We managed to get the hats on several dogs, including Chloe, and we watched as they each tried to shake them off. Some might have considered this game mean (why torture the poor dogs? ), but we laughed at their cute, comic struggles. After about 10 seconds, the hats became play things as one by one, the dogs got them off, took them in their mouths, tossed them in the air and/or ran off. Soon, the run was littered with mushy piles of chewed-up cardboard and string. Eventually the wine ran out and the dogs got tired. Chloe returned to my side, panting, with bright eyes and a smile on her face as if to say, This is fun! I put one last birthday hat on her head and watched her run away and try to shake it off. She did so with a grunt and then stepped on the hat, looking up proudly, like a conqueror. This seemed to signal the end of the party, and we all gathered up our bags and leashes and dogs and said goodbye. Once Chloe and I passed through the exit gate, my friend handed Chloe’s birthday cake over the fence, making sure that the other dogs did not see. It was packaged in a little pastry box tied with string, and as I carried it to the car, Chloe kept leaping up and twisting in the air—because somehow she knew this was her birthday cake. For me! her leaps seemed to be saying. Cake for me! I always enjoy watching her leap like this—with such joy—because she spent much of her early life in a shelter. As she continued to bark and spin, I thought of all those shelter dogs, still waiting for homes. I hope that each one will have the chance to celebrate—and be celebrated—in such a way: with fun and sun and glorious weather, with trips to the dog runs to play with friends, with long walks in the park amidst the spring flowers, then lamb chops for dinner and a wellearned nap. A life like any other, only more so. When we got home, Chloe wanted to snarf down the entire cake in one gulp, of course, but it was big enough for three meals, so we split it into thirds. As I put the two extra slices into the refrigerator, she looked at me rather forlornly, as if she had been betrayed somehow. She seemed to know (being a smart dog) that it was still her birthday and would remain so until 11:59. “Oh, all right,” I said, and gave her another spoonful. And then two more. The rest, I decided, we’d give to a neighbor—an elderly woman who was constantly bringing home abandoned Pit Bulls from the streets. “Is that okay?” I asked Chloe. “Do you approve?” She thumped her tail a few times, which seemed like a yes. Those poor Pit Bulls deserved a special treat to celebrate their new lives too. The postscript to this story is that my 55-pound dog soon blossomed into an 80-pound dog. This had nothing to do with birthday cake. My French Spaniel mix now had the long and wide-ribbed body of a Labrador Retriever. This also meant that Chloe probably was born around March after all. She was a spring baby, as welcome as a new flower. Which is always a cause to celebrate. In my dogless years, I suffered from depression during the winter months. Seasonal Affective Disorder (SAD) they call it, but for me, it was more ISMICGOOB. (I’m So Miserable I Can’t Get Out of Bed). I won’t go details about my emotional state or describe the dire thoughts and feelings that whirlpooled around my sun-deprived mind. Let’s just say that during the winter of 2003, I was a mess. My beloved dog Wallace had died, I had divorced my husband and all I loved most about life—including the sun—had receded. Winter nights in the Northeast can be 14 to 16 hours long. But it seemed like 24. One particularly dark night in January, the police actually showed up at the door of my lovely but secluded house in Woodstock, N.Y. My former husband had called them, because he hadn’t heard from me in days, and he was worried. (Even though we had parted—he still sensed these things.) I remember how terrified I was to be awakened by pounding on my front door; how disorienting it was to see flashlights beaming into my bedroom window. 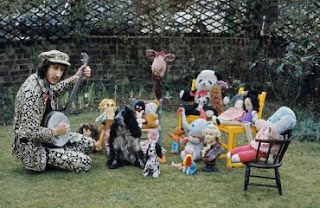 I remember thinking, If Wallace were here, he would have barked. Dogs sense our emotional states even better than husbands (or ex-husbands). Wallace would have let me know that the men outside the window were no threat. That even though it was dark and bitter and miserably cold and winter, we were safe. Anyway, that was then, this is now. I have Chloe now. After that odd but enlightening (no pun intended) incident with ISMICGOOB, I consulted a doctor—a pioneer in integrative medicine—who prescribed vitamin D; rhodiola; structured yogic breathing to stimulate the pineal gland and produce serotonin; and a high-grade, futuristic and a $500 light box. He also prescribed the usual: rest, exercise, laughter, companionship and so forth. In other words, he prescribed a dog. Shortly before the winter of 2004 descended like a dark curtain—in fact, only before Daylight Savings ended, I adopted Chloe. Now, I don’t mean to imply that I adopted her because of the forthcoming winter—I had begun the process in August—but I was grateful for the timing. The universe sometimes gives us what we need, when we need it. We lived, then, in New York City, which has its own particular version of winter. After the first half hour, the snow isn’t beautiful. It’s just this inconvenient thing you have to slog through to get some place you wish you didn’t have to go. Then, giant snowplows driven by angry New Yorkers scrape the snow violently into piles (scraping the side of your car along with it). The “snow boulders” just sit there for months, in great unattractive heaps the color of dung. With some piss-yellow thrown in (courtesy of men and dogs). The cold in the city is more biting, more aggressive, somehow. City wind knows how to turn corners, fly up your skirt and speed through intersections as if trying to beat the red lights. And then there’s our source of heat: steam radiators that clang at night, as though some ghoul were hiding under your floorboards, banging a wrench against your pipes. For dogs, the NYC version of winter includes all of the above, plus paw pain from chemicals spread on the sidewalks and the indignity of being forced to wear clothes, such as plaid Burberry lumberjackets and little canvas booties with “anti-slide” soles. Don’t get me wrong. I love New York. And dogs love anything. But New York in winter? Not recommended by SAD doctors. So we moved back to the Catskills, to Woodstock. Back to the garden, as the song goes, back to the land of peace and love. And light and space and air. One of the first things we did after unpacking was visit a local park called The Comeau Property, 76 idyllic acres of meadows, woods, streams, swimming holes and grassy fields. Chloe had plenty of land to roam on our own six-acre property, but I wanted her to make new friends. I wanted new friends, too; people with SAD should avoid isolation. Thus, we met Greg, a way-cool musician and conceptual artist in his 50s, and his handsome Setter, Rainbow. (It was love at first sight for the Rainbow and Chloe; they have now been engaged for seven years, but have yet to set a date). Next we met Lilly, a witty photographer and her dog Sparky—a Pointer mix who had the air and expression of Nietzsche. 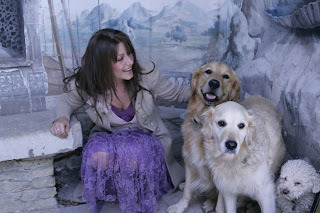 The three of us humans not only had dogs in common: it turned out that we were all recent transplants to Woodstock. Greg and his family, up until then, had lived full-time in NYC, and Lilly came from Miami by way of Los Angeles. All three of us were also prone to SAD and facing our first Woodstock winter with trepidation. But, we had our prescriptions and we had our dogs. Prescription 1: Avoid isolation. In the winter, those of us with SAD mostly want to hibernate. We want to hide in our emotional cocoons of lethargy and also in our literal cocoons of heavy down jackets with giant puffy hoods, which we zip from head-to-toe and cinch tightly around our faces. Nothing shows except a nose, which is always red and runny from the cold. Dogs, on the other hand, expand in winter. We’ve all witnessed this. They get friskier, more energetic. They tend to bounce around more, run in circles at every occasion (a ringing doorbell! A trip to the mailbox!) and exhibit new hidden talents for leaps and pirouettes. As the temperatures drop, their coats thicken and their pupils shrink to focused pinpoints, which somehow makes them look more alert, and feral. At Comeau, our dogs seemed overjoyed with the new weather and their new pack. I loved to watch their ecstatic, bright-eyed faces as they ran through the white fields, and the way they seemed to smile as they leapt through the high drifts in buoyant, dolphin arcs. I loved the way they threw their bodies into the snow and shimmied on their backs, pushing themselves upside-down through the drifts, only to leap to their feet again and shake it all off. Rainbow saw any dog on his or her back as fair game, and took the opportunity to get in a playful nip on the neck, rump or leg. I loved the way they would dive, twist, and nip, exhausting themselves with their clever dog maneuvers, and how they would pause from play, just slightly, to scoop some snow—powdery and pure—into their mouths for quick refreshment. Chloe always seemed rejuvenated by her “snow snack,” as we called it, like a hearty Russian explorer clearing her head with a shot of ice-cold vodka. Snow, I realized, was like a drug to dogs. A puppy upper. Something else I found endearing was that Chloe was the least athletic among her new country-dog pals. Rainbow could clear six-foot fences and outrun snowplows, and Sparky—thick in the middle—could take a hit like a seasoned defensive lineman. Chloe, however, walked around puddles and, when she ran with the boys, was always a few yards behind, her ears flopping behind her as she ran with cure girly determination. She didn’t mind being at the bottom of the hierarchy. She was just happy to have friends. She always trotted back to us with a smile on her face, as if to say: See, I’m hanging out with the cool guys. That smile warmed our hearts. This was much better than hanging out isolated at home with a SAD woman. Prescription 2: Sunlight. For those of us with SAD, doctors prescribe at least 40 minutes each day in front of a light box or in direct sunlight. When our pack gathered at Comeau in the mornings, we always stood in the open field, in the sunshine. As the weeks passed, our positions shifted slightly so that we could get as much exposure and vitamin D as possible. We seemed much more aware of time after winter solstice, because we gained a full two minutes of sunshine every day. I loved the way the low, slanted light sieved through the bare trees in the morning. The sun seemed put in extra effort, just for us. The dogs seemed to be putting in extra effort, too. If our conversations started to veer toward the negative some mornings (it’s cold, it’s dark, we have no mental or physical energy, Woodstock has no decent coffee), the dogs would increase the intensity of their play. They’d position themselves right in front of us and take turns spinning, biting, chasing, pouncing and wrastling. (I know wrastling is not an actual word, but it should be). Usually, Chloe was on the bottom of the play-pile, pushing the male dogs off with her hind legs. As she twisted her body to the right to get in a defensive leg-nip, Rainbow would leap over her head, Sparky, as if choreographed, would circle around them and then swoop in for another chomp on her neck. It was kind of like a canine Cirque du Soleil. After several minutes of dramatic play, they’d pause, gulp some snow and then smile at us, as though expecting applause. Which they always got. Prescription 3: Laugh. On weekends, Greg’s wife Mindy joined us, along with their seven-year-old son, Clayton. Clayton was the instigator of many a dog game. In fact, he played as exuberantly as the dogs: he’d dive, tackle, roll, and had no problem falling face-first into the snow. He would insist that we bury him neck-deep in the higher drifts so that the dogs could play “find the avalanche victim.” Clayton insisted on riding his toboggan down the hill by himself, so the dogs could follow along, like a great team of bodyguards, and pig-pile on him en masse at the bottom of the hill. Once, Clayton somehow wrangled Rainbow onto the toboggan, wrapping his legs around the dog to keep him in place. Rainbow looked positively miserable, his tail curled underneath him as we pushed them down the hill, but still, he submitted because he loved his family. Dogs will do anything for love. Prescription 4: Establish a routine. We met at the park at 8:28 AM exactly. Greg had to drop Clayton off at his school bus at 8:17, and it took him 11 minutes to reach Comeau. This meant I had to leave my house at 8:21, and also that around 6, Chloe would be at the door with her nose pressed to the crack, tail wagging, dancing up and down with excitement. Our small foyer was narrow, and it was it difficult to open the door with an exuberant, 60-pound dancing dog trying to wedge her way through. Her enthusiasm made me smile. And smiling is a nice way to start a day. It took me seven minutes to drive to Comeau, and in those seven minutes I always tuned in to Writer’s Almanac on NPR. I loved listening to Garrison Keillor recite poetry in his smooth, soothing voice. (Poetry: another wonderful antidote to SAD.) Meanwhile, in the back seat, Chloe would be pressing her body forward with a serious and focused look on her face, as if she alone was responsible for guiding us. 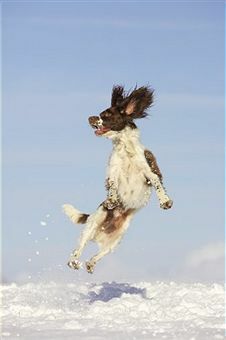 When we arrived, Chloe leaped [LEAPT?] out of the car and ran in circles, looking for her friends. Lilly, Greg and I usually arrived at the same time. Lilly drove a Jeep. Greg drove an old but elegant Mercedes wagon, which, being a Mercedes, ran quietly. But if Greg was late, we could hear Rainbow yowling in excitement from a quarter-mile away. Rainbow, the most vocal of our dogs, greeted Sparky with a chummy grunt and a body slam; his girlfriend Chloe got a more emotional “a-woo-woo-woo.” Chloe—not much of a barker—whimpered in a cute, coquettish way, and Sparky would just do a little leap and then stand calmly by Lilly again. Sparky kept his real thoughts to himself. After this brief canine greeting, the dogs greeted the humans with kisses, tail wags, crotch-poking and figure eights. Then, led by Rainbow, they tore off into the fields, bounding through the snow. Next, we humans would walk to our spot in the sunshine, drink our coffee, complain about the cold, absorb our daily dose of vitamin D. After the prescribed 40 minutes of sunshine, we would start the official walk. Prescription 5: Spend time in nature. Comeau is a large park, but the hiking trails are modest. It would take a dogless person probably 20 minutes to walk them. Our pack liked to amble, so it would take us 45. We liked to pause and point out the beauty of ice clinging to pine needles, we liked to stop and listen to the sound of water flowing intrepidly beneath the frozen surface of the Mill Stream. And, of course, we liked to watch the dogs: blazing their own trails through the snow, chasing the squirrels who chittered at us from the trees, or—glory of glories—finding deer poop to roll in (Rainbow ) or eat (Sparky) or both (Chloe). Somehow, Chloe’s rolling offense seemed less gross in winter, because I could quickly wipe it off with a handful of snow. Seeing beauty is also important for a person with SAD—or anyone, really. And while winter beauty can be lonely and stark, it is a beauty that points forward somehow. With the trees bare, we could see the mountains beyond and the steeples of white churches, and soothing curls of smoke rising from chimneys. There is something about being able to see through the distances, especially in winter, which reminds us that there is always a beyond. Plus, we had three bird dogs, the sort of dogs who always roamed far ahead of us and pointed at things worth seeing: bright red berries on the holly bushes. Chickadees and cardinals. Our dogs were our rangers, our trail guides. I liked following their paw prints in the fresh snow. It felt as if we were doing something entirely original and new. The trail led us straight back to the parking lot, where we would say goodbye for the day. It took a lot of coaxing and bribing and promises of bacon to lure the dogs back into our respective cars (Chloe usually wanted to go home with Rainbow). But they always gave in, knowing that they were going home to hearty breakfasts and warm fires. Prescription 6: Take care of your body. On the way home, I stopped at Sunfrost Café for carrot juice with a shot of wheatgrass. The juice rejuvenated me in a way that, I suppose, Chloe’s gulps of snow rejuvenated her. There was a sense of freshness, of eating something clean. Then we’d go home. In the foyer, I’d remove my boots and Chloe would shake off the final flakes of snow. I loved the way she smelled—it wasn’t so much the smell of wet dog as the smell of cold. Of winter at its best. After Chloe had licked the final chunks of ice off her leg feathers and from between her toes, both of us would go upstairs, where I’d light a fire and brew a cup of tea. As soon as I latched the door to the woodstove, Chloe would curl herself up on the hearth. Prescription 7: Rest. The hearth—that’s the best thing about winter. The center, the source of warmth, the fire element, our own personal sun. Whenever I see a dog lying by a hearth, I have the sense that life is exactly as it should be. That winter is a time to be home. Prescription 8: Practice gratitude. Some days, the mornings at Comeau were the only sane hours I had that winter. But those hours accumulated and built upon themselves, as did the vitamin D in my body from the sunshine; the number of times I laughed at the dogs’ antics; and the number of great, deep breaths I took in that pure mountain air. Slowly but surely, I found my frame of mind shifting from, excuse the pun, SAD to glad. Zen master Shunryu Suzuki-roshi once wrote: “If you can just appreciate each thing, one by one, then you will have pure gratitude. Even though you observe just one flower, that one flower includes everything.” Dogs seem to instinctively know this. I remember that during one particularly grim winter, before I had dogs, I had to work very hard to find things to appreciate. (Such a statement might sound obnoxious, but this is the state of mind of a person in the throes of SAD.) I have always loved stars—their calming presence, their cool, serene beauty—but that winter, not even stars made me happy because, well, because of SAD. The fact that I could not even appreciate stars made me feel even worse. Then, I decided to be grateful that other people appreciated stars. And that one shift in perception and attitude lifted everything up again. The winter night sky in the Catskills is beautiful beyond description, with stars plentiful and bright and acute. When I step outside at night and look up and out, I feel as though I am seeing all of eternity. And I realize I never would have experienced this feeling if I didn’t have a dog. Because, believe me, I would not be outside in below-zero weather for any other reason. In the mornings, I am the one who has to coax Chloe inside after our walks. But at night, it is she who rushes back to the house first. Now, even on the darkest, longest winter nights, I feel as if I could stand underneath that starry sky forever. It reminds me that there is no such thing as sadness. Just an infinite number of worlds, working in harmony. “Look,” I say to Chloe, pointing up. “Sirius. The dog star. That’s you!” She wags her tail, and her breath forms a cloud in the air, which seems like a loving answer. And we go inside. Where it is happy and warm. For those of you in Florida, I'll be doing a combination reading, book signing, dog adoption fair, and dog costume contest at the New Smyrna Beach Library in Florida this Thursday, 2/16 at 7 pm. Come see some of Volousia county's cutest dogs! The dog with the best costume wins a copy of the paperback edition of Rex and the City!